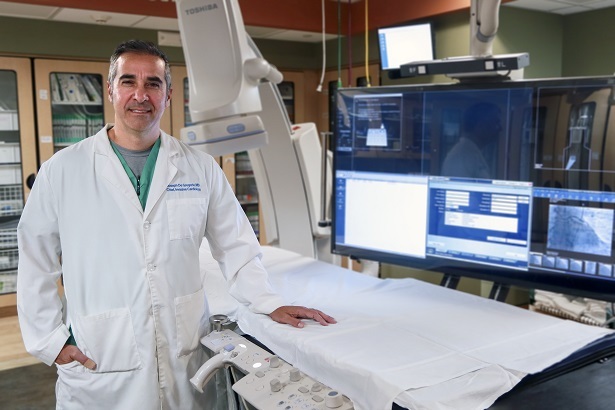 Dr. Joseph De Gregorio, chief of invasive cardiology and principal investigator of the ABSORB trial at Englewood Hospital and Medical Center. September 6, 2016 – Englewood Hospital and Medical Center is one of the first in the nation, one of two in New Jersey, and the only hospital in Bergen County to offer a recently FDA-approved, first-of-its-kind dissolvable heart stent to treat patients with heart disease. Englewood Hospital performed its first case on August 8, following the U.S. Food and Drug Administration’s approval of the Absorb stent in July. The hospital was a leading enroller nationally to the ABSORB study, a 3-year clinical trial of the device. With the arrival of the Absorb dissolvable heart stent, manufactured by Abbott Vascular, Inc., patients receive the same benefits and outcomes as the traditional metal stent without the concern of carrying hardware in the body indefinitely. Like the metal stent, the Absorb drug-coated device holds the clogged artery open and slowly releases medication to the diseased area. After blood flow is restored, the stent, which is made from material similar to dissolvable stitches, is absorbed naturally by the body in two to three years. As a result, the risk of certain types of blockages that can occur with metallic stents is reduced, additional interventions in the future may be easier to offer, and the treated artery may return to normal since there is no metal restricting its movement. The Absorb stent is not for every blockage, but is beneficial for certain patients who may need to have coronary bypass surgery in the future, as well as those who have specific types of blockages. Coronary artery disease is caused by a buildup of fatty deposits called plaque, which narrows the arteries that supply blood to the heart. As a result, patients with heart disease may be at increased risk of heart attack. Since the 2000s, drug-coated permanent metal stents have been the standard nonsurgical intervention used to restore blocked arteries.